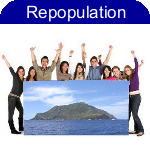 Welcome to the official web site of the Government of the Pitcairn Islands. 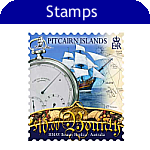 The Pitcairn Islands group is a British Overseas Territory. It comprises the islands of Pitcairn, Henderson, Ducie and Oeno. Pitcairn, the only inhabited island, is a small volcanic outcrop situated in the South Pacific at latitude 25.04 south and longitude 130.06 west. It is roughly 2170km (1350 miles) east south-east of Tahiti and just over 6600km (4100 miles) from Panama. The Islands' administrative headquarters are situated in Auckland New Zealand, 5310km (3300 miles) away. With a population of only around fifty, the people of Pitcairn are descended from the mutineers of HMAV Bounty and their Tahitian companions. 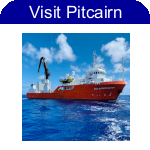 Pitcairn Island is approximately 3.2km (2 miles) long and 1.6km (1 mile) wide with the capital Adamstown located above Bounty Bay and accessed by the aptly named road, "The Hill of Difficulty". Pitcairn Islanders sing "In the Sweet Bye and Bye"